F*ck off goalkeepers, f*ck off defenders, f*ck off midfielders, f*ck off strikers. F*ck off substitutes. F*ck off injured players. F*ck off Roberto Martinez. F*ck off Graeme Jones. F*ck off coaching staff – especially you Franny f*cking Jeffers, and you know why. F*ck off Bill Kenwright, f*ck off board, f*ck off tea ladies, #f*ckoff @Everton on Twitter, f*ck off Goodison Park. F*ck off Everton. Chuck the lot of you out the window and hope you land on Lee Mason. Right. Now I’ve got that off my chest, and completely ruined any chance of these previews ever being seen as respectable literature, we can get down to it. Oh, wait. The Daily Mail’s claiming we’re jibbing off Roberto Martinez and bringing in Steve McClaren. Head’s gone. What is this world coming to? Just dire against Stoke. Just so dire. The performance was listless and although Stoke weren’t much of anything, they deserved the win by virtue of us being so abysmal. I don’t see this one as the tactical nightmare the Southampton defeat was – when two substitutions are enforced due to injuries and John Stones is limping around it ties a manager’s hands somewhat. Replacing Stones with a more offensive player with ten minutes left may have worked but hey, it’s easy to call in hindsight. The onus falls on the players really. It was listless. It didn’t even reach pedestrian. It could’ve been pedestrian, but it wasn’t even arsed to leave the house. Basically it was the lazy gobsh*te armchair enthusiast of performances. Which is handy, because that lot have been laying into the Everton too. Sack Martinez? Pipe down you lot. A couple of months of struggles and you want to pack him in. Madness. What hurt a lot was the lack of inventiveness. The Martinez philosophy is meant to entail expressive play. Seamus Coleman made a lot of runs inside full backs, but not once was he found with a pass. In fact, when an incisive ball came through, it was mostly from Gareth Barry. When the right ball came through our man galloping through the middle was hauled down by Jon Walters. That was Lukaku, right? Barkley? Mirallas? Naismith? Nope. Leighton Baines. I’m not even sure what Barkley did – that could be put down to him being shunted out left. Mirallas, Lukaku and Naismith had a disturbing lack of chances, and when something fell their way it went awry. Definite red for Walters that. Not a penalty either. There’s a nice useless biased opinion. Means nothing, because Walters stayed on, Bojan scored from the spot, and while Stoke’s one goal can be pinned on dodgy refereeing, who takes the blame for our zero? We do. No dodging responsibility. That’s exactly where Roberto Martinez stands. There’s no dodging this one – we have not been good enough. Not by any stretch of the imagination. The bar was set high by a magnificent season last time out, we spent a significant amount to only build on last season’s squad by a small amount, and the performances have been on the most part uninspiring. Have we had a properly good 90 minutes? Wolfsburg away was a success in securing a result rather than performing as we wish to. There have been many good first halves, but not many commendable efforts have been put in after the break. That suggests that we don’t have the required stamina to rescue games. Whereas last season we were always worth a late goal, there seems to be nothing on offer when it is most desperately needed this time around. The last thing we needed was two games in three days. But hey, here we go. Time to end 2014 either with a bang or with a whimper. Bit of an injury crisis too, just to spice things up. Howard, Hibbert, Osman and Gibson definitely out. Mirallas and Stones are doubts. Steven Naismith’s suspended. And we’re off on what hasn’t been a massively tough away day for us for quite a while but now it’s anyone’s game. Newcastle. The biggest unfounded superiority complex in football. What constitutes a “big team” anyway? There’s a club in the North East that has won the First Division 6 times, has 2 FA Cups and hasn’t won either for 41 years. That’s Sunderland, and they’re not a big club because their stadium holds a mere 48,000 apparently. Then you have Newcastle United. Four league titles, six FA Cups, but haven’t won anything of note for 59 years. Actually, I’ll be nice and let them count the Inter-Cities Fairs Cup. That was 45 years ago. But they have a nice big 52,000 capacity stadium so they’re huge lad. Huge. Only club in a big city and they wonder why they get such attendances. And then you have the exact same complex in Alan Pardew, a man who believes in his hype to such an extent that he was probably sat by the phone in the summer waiting for Manchester United to call. The fact he’s still a Premier League manager is stupefying. I’d accept the post-match celebrations of any manager – Mark Hughes for example. Yeah, alright Mark. Well done. But to see Pardew with anything except a mortified look on his face would be a nightmare. You can sift through the melts at St James’ Park to find some truly likeable, grounded Newcastle fans. Look inside Pardew and there’s nothing. Even the Grinch had a soft spot, but Pardew is simply an omni-pr*ck. Jak Alnwick in goal for them, now destined to have his only great game ever before we see him at Doncaster Rovers in three years’ time. Daryl Janmaat and Paul Dummett as full backs – Seamus Coleman has no excuse not to go and pester Dummett – while Steven Taylor and Fabricio Coloccini will be in the middle. Chieck Tiote returns to the midfield and will probably join Jack Colback, Yoan Gouffran and Moussa Sissoko. Sissoko’s fantastic. He should be considered the single largest threat we face here, not least because he’s actually massive. He takes the ball from anywhere in midfield and charges forward, looking to create chances as he goes. Great that. Doesn’t that sound just perfect? Hmm. 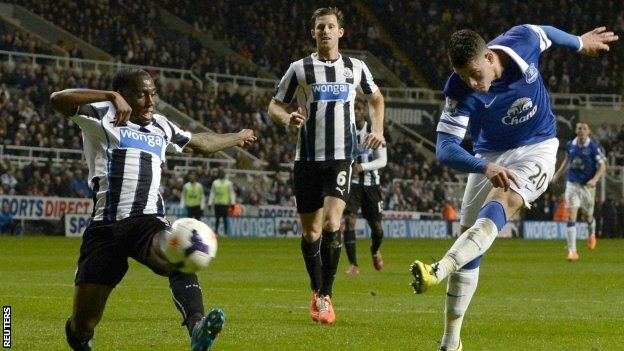 Ayoze Perez is in good form so he may get the nod again alongside flops-to-be Emmanuel Riviere or Remy Cabella. Or maybe the youngster Armstrong will start as Alan Pardew pictures the “(GENIUS MANAGER’S BRILLIANT DECISION MEANS) Local Lad Comes Good” headlines. Not great, but there are dangers there. Joel Robles in goal, almost a year to the day since he replaced Tim Howard for the home game against Southampton…and let a Gaston Ramirez flyer go through his fingers. We may need the power of prayer here. Coleman right back, Baines left. Stones and Alcaraz, possibly. While both are classy players on the ball, neither are particularly quick, and that may be an issue against the likes of Perez. McCarthy and Barry remain intact. In front it may well just be time for Mirallas right, McGeady left, Barkley middle. Three players all in their natural positions bombing forwards and feeding Romelu Lukaku. How he’d love that. If Mirallas is out Eto’o comes in and the whole formation becomes confused again. What do we need here? We need the centre backs and defensive midfielders to keep a steady ship. Baines and Coleman need to bomb forward and move the ball quickly. The attacking midfielders need to take players on, beat them, and try that tricky but clever pass. Lukaku needs to see those passes, understand his duty, beat those centre backs and have a go at goal. They’ve all done it before, so they can do it again. We could easily let the expectations drop now. Not gonna have a great season are we. Probably gonna lose this, eh. Those expectations are the only things that will drive us forward. Remember that 3-0 at St James’ last season. Remember Barkley racing 80 yards and telling the Newcastle fans to pipe down. Even Leon Osman scored. We want that again, Everton. You’ve frustrated the hell out of us recently, but now’s the chance to end 2014 with a timely bow to that period of time that made this year great. So don’t bother coming off that pitch until you’ve given everything you’ve got. Nil Satis Nisi Optimum, right? Solo lo mejor? Those words still have meaning. Here’s your chance Everton. Get at them.